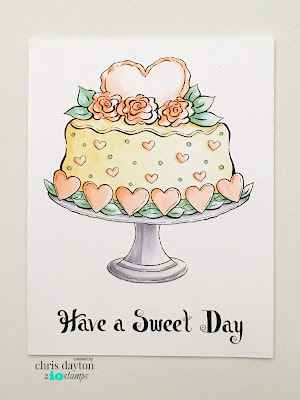 The IO Design team has lots of beautiful new stamps and Valentine/Spring inspiration to share with you today. AND Gift Certificates to give away! Lets begin with these adorable robot images, stamped with Memento ink on Hammermill Digital Cover Copy Cover, and colored with Copic Markers, then coated with a light coat of Spectrum Sparkle pen to give that shiny metallic look. This robot features the hearbeat image from the previously released Heart Beats clear set (CL562) and the fun graphic sentiment Heart Beats (D19671). Both are stamped in coral ink, then overstamped with Versamark ink and clear embossed for shine and texture. 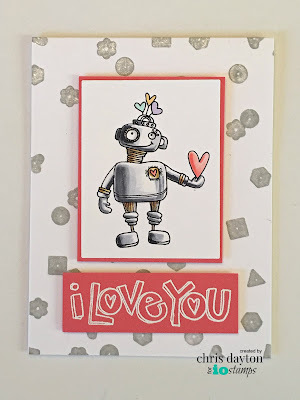 For this robot card, I stamped the Confetti Background in a contrasting warm gray ink, then added Spectrum Sparkle pen to the gray images. 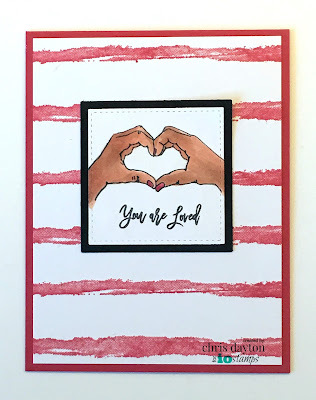 The I Love You sentiment was heat embossed in white to a strip that matched the mat for my focal image. 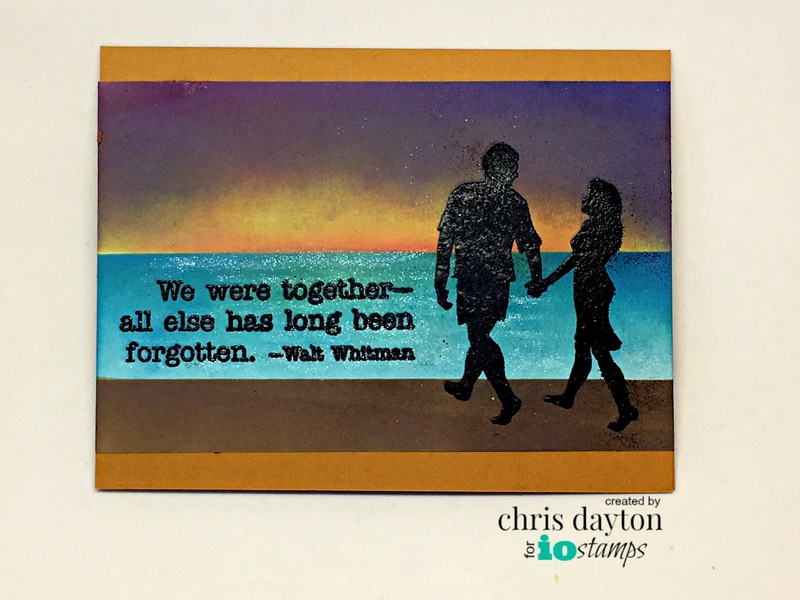 This card features the silhouette stamp Walking Couple. I first created the sunset background with Distress Oxide inks on hot press watercolor paper. I used Post-It tape to mask the horizon and boardwalk areas as I created the water, then removed the masks and covered the water to protect it while I inked the sunset and boardwalk. I added Spectrum Sparkle to the water before stamping the Walking Couple and the Walt sentiment in Versamark and heat embossing in black. 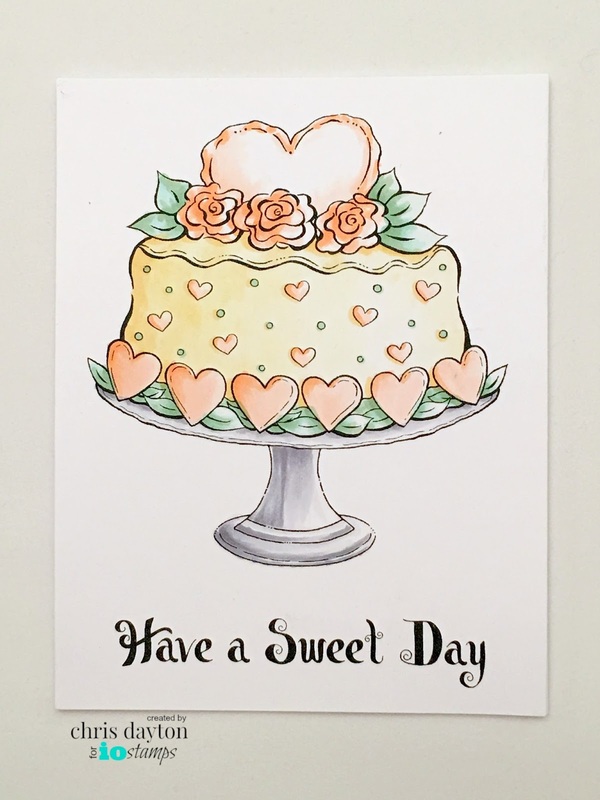 This pretty Heart Cake makes a great spring birthday card when paired with the Sweet Day greeting. 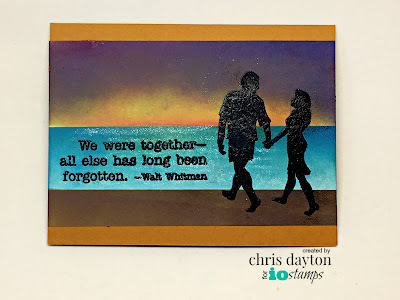 I chose to stamp with Memento ink and color with Copic markers. This is a simple card that is easily mass-produced. I stamped the Watercolor Stripe (E20427) three times onto my white 4" x 5.25" panel using my MISTI, moving my paper to create the repeating pattern instead of moving my stamp. My focal image is one of the images and sentiments from the clear set, Love Hands (CL814), stamped in Memento and colored with Copic Markers. Thanks for joining us for this Valentine Release Hop! Don't forget to leave comments along the way to be entered for the drawings for IO Gift Certificates. Winners will be announced December 11th on the IO Blog. All the new release products are available for purchase now at IO Stamps. Your next stop on the hop should be Dina Kowal. our sweet little robot girl is super cute! Love the coloring technique too! You achieved a very realistic metallic look on the robots. Love the colours on the cake card. The variety of cards are amazing! Love the robot ones, super cute! Beautiful array of cards here. The first one's robot is so pretty! I love her! Awesome cards! Love the robot and the cake! Great cards!! Love seeing all the new stamps!! So many cool cards!! My fav is the walking couple... they really look like a photo of a couple walking on the beach at sunset!!! the robot with the heartbeat is ca-ute! very pretty! love the robots and the silhouettes! Another amazing post full of beautiful inspiration! Thank you, Chris! love them all, but the heart cake is my favorite! I need the robots. They are adorable. Thanks for sharing. Beautiful. Those robots keep speaking to me. I love how you created your first card a lot. The sunset background on the couple's card is amazing & I love those cute robots! Cute and wonderful cards. 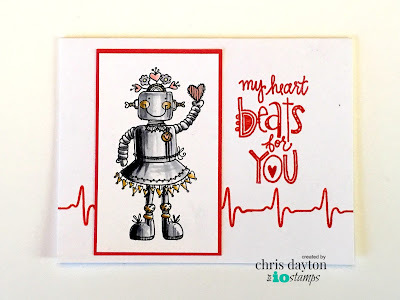 I like the heartbeat on the first robot card. I like each of these cards for different reasons. The couple silhouette is great, and love the color combos you chose!